Mixed Blood is calling its upcoming celebration of its 40th anniversary "A Red-Tie Affair." But, considering the venue for half of the evening, shouldn't they call this spring fling "A Purple-Tie Affair" instead? The evening is to feature cocktails, wine and beer, plus a "sampling of fresh and modern fare at the many food stations." There also will be a "silent auction for trips, gifts, and adventures, and getting down to the sounds of incredible local musicians." His Purple Highness recently has shown that he digs theater, or, at least, jamming in a theater. Last weekend Prince shocked and thrilled audiences with an impropmtu performance at Chanhassen Dinner Theatres. Of course, Paisley Park, with its "Purple Rain" memorabilia, is its own attraction. People trek from all over the globe to see it, which puts the gala ticket prices in perspective. VIP tickets, which includes valet parking and activities at both Paisley Park Studios and Mixed Blood, are $275. General admission to both is $175. Mixed Blood is also offering $40 tickets to the after-party. 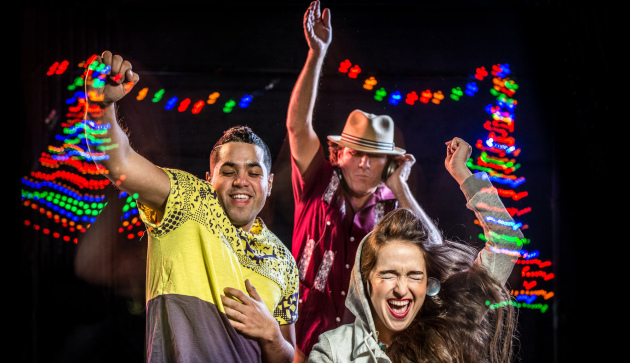 The gala supports Mixed Blood's programs, including its world premiere production of "DJ Latinidad" (pictured above), a dance party celebration of Hispanic culture. The company has a free rush line and $20 admission to its shows, part of a "radical hospitality" program initiated years ago to make the theater open to all. For gala tickets, contact whitney@mixedblood.com or 612-338-7106.